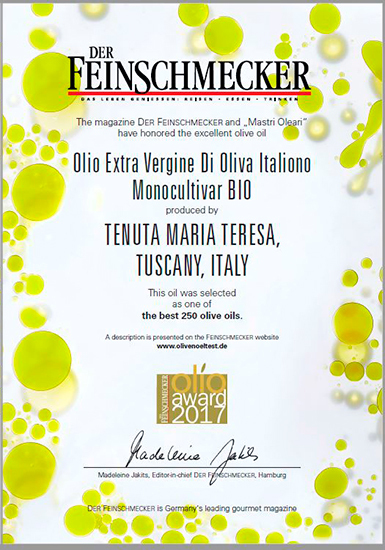 Tenuta Maria Teresa > News and Info > extra virgin olive oil > OUR EXTRA-VERGIN MONOCULTIVAR LECCINO OLIVE OIL 2016 HAS BEEN INCLUDED IN THE FEINSCHMECKER SELECTION! OUR EXTRA-VERGIN MONOCULTIVAR LECCINO OLIVE OIL 2016 HAS BEEN INCLUDED IN THE FEINSCHMECKER SELECTION! Book a visit of the farm in order to taste our products!